*Donovan McNabb is speaking out for the first time since he was benched by Washington Redskins coach Mike Shanahan for the remainder of the season. The veteran quarterback told DC’s ESPN980 earlier today that he felt disrespected by the way the whole thing went down. McNabb said he strongly disagreed with the decision to bench him, but he has a bigger problem with the way he says the organization leaked the news to the media before informing him. Shanahan waited until Thursday evening to tell McNabb that Rex Grossman would be the starter for the rest of the season, even though rumblings of a possible switch had been circulating all week. 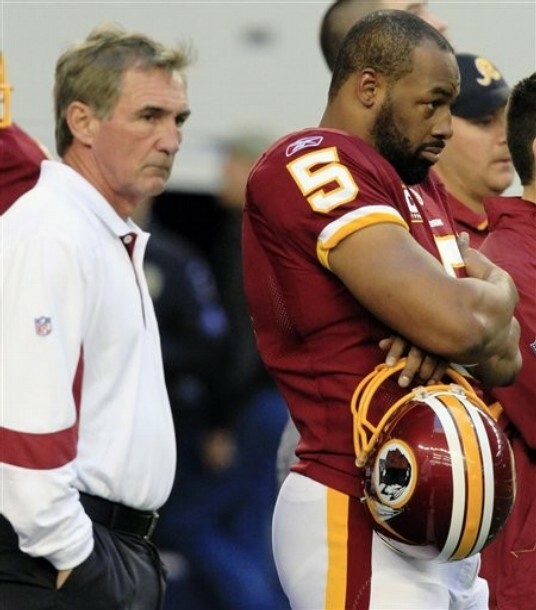 Washington Redskins head coach Mike Shanahan, left, and quarterback Donovan McNabb stand on the sidelines before an NFL football game against the Dallas Cowboys, Sunday, Dec. 19, 2010, in Arlington, Texas. McNabb said he wasn’t even aware that he was being demoted to No. 3 quarterback for the final two games of the season until Shanahan announced the move to reporters the next day. As for the benching, McNabb conceded he’s had a tough year, but he said he felt he had made enough progress in his first season in the Redskins’ offense to give the team something to build on. Shanahan said he benched McNabb because the team had been mathematically eliminated from the playoffs and he wanted to evaluate the two other quarterbacks, Grossman and John Beck. and neither one of the QB’s I listed above have a resume’ even close to McNabb’s….not even close…. This is all about that sham contract which they gave McNabb. It was all a publicity stunt and this is how they are going to make sure that he never collects. The seeming huge sums associated with the contract were going to be based on his “performance”, rather, their evaluation of his performance. By benching him for the rest of the season, that’s their way of guaranteeing that his evaluation will not be up to par. And that is what I found most offensive about the whole thing. What has McNabb done to be told that you are done for the season, given the fact that he was playing against the best teams in the league, Giants, Eagles, Cowboys…. I thought every position on the field was based on your last performance. So what if Grossman blew all the games? Of course McNabb will still remain on the bench, to ensure that they don’t have to pay him. 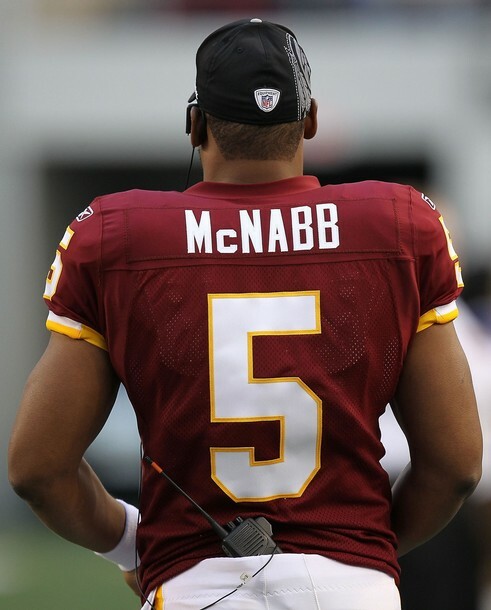 Knowing McNabb, he may just go out there and give an MVP performance for the rest of the season. And that’s what they definitely don’t want.